And I don’t care who knows! This thing is one of the best things ever invented!! It is warm and cozy and I can text and talk on the phone and eat all WHILE WEARING MY BLANKET! And LOOK! It is pink! For Breast Cancer! A blankie with a purpose! WOOT! It was one of the best gifts EVER! I spent all day Sunday and most of today in my Snuggie. Now I see why people want to wear them out of the house, to football games and whatnot. I want to take it to the movies, where I am ALWAYS freezing! Or to the grocery store, where I am also always cold. Better yet, I would like to NEVER leave my couch again. 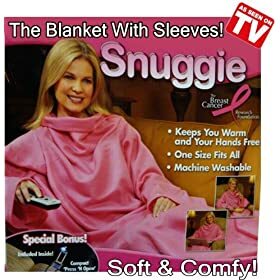 I just want to stay in my Snuggie. I am convinced it has some kind of magnetical attraction to my couch. Or something. It is my new security blankey. Just me and my snuggie. BFFs always and until the end of time!